Buddy Emmons has often been called “The World’s Foremost Steel Guitarist”. 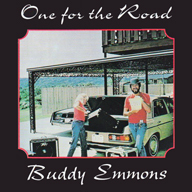 On this track from his One for the Road CD, Buddy salutes the great American pastime – baseball – on the quintessential American instrument – the pedal steel guitar. The tune is a favorite of fans at steel guitar shows, where Buddy hits a “home run” every time!